Writing Uphill: God bless Texas. And Tegaderm. Can we call it Texaderm? God bless Texas. And Tegaderm. Can we call it Texaderm? But sometimes you don’t have time to be systematic. And some problems are unrealistic or undesirable to repeat over-and-over in search of the optimal solution. In these instances, it’s best to find someone with expertise. Who will have expertise? People who regularly encounter extreme versions of your problem. So, if you fall while running and skin your knees, don’t look up how to treat skinned knees. The standard medical sites will give you stock suggestions about washing your hands, cleaning it up, putting on some ointment, and covering with gauze. And not picking the scab, and calling the doctor if it needs stitches or gets infected (duh). And of course, when you select a bandage, you should read the instructions on the package to make sure you’re applying the bandage properly. Nope, this is bad advice. Or at least incomplete advice. What’s the extreme version of skinning your knees on a pristine suburban sidewalk? Flying off your bicycle on a gravel road, wearing nothing but Spandex. 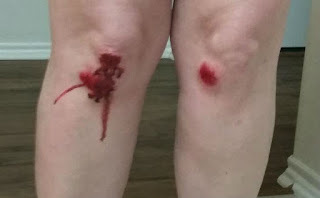 So, if you want to know how to treat badly skinned knees, consult biker blogs. (Here, “biker”=”bicyclist”, not “motorcyclist”.) When it comes to road rash, bikers are the experts. 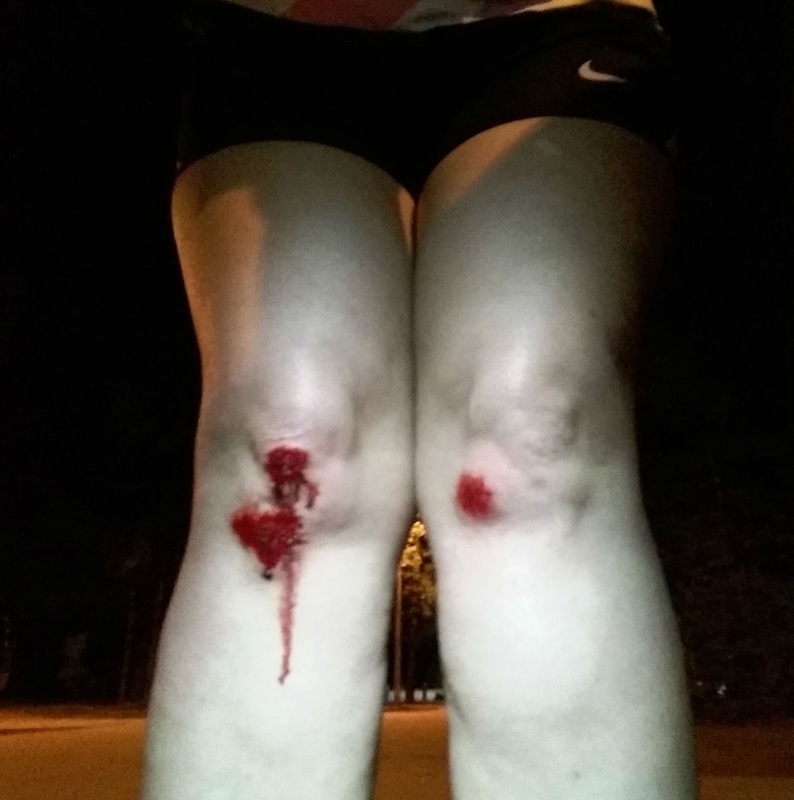 Last Monday night when I tore the skin off my knees while running, we triaged it with materials on hand, which turned out to be identical to the standard ointment/gauze advice. 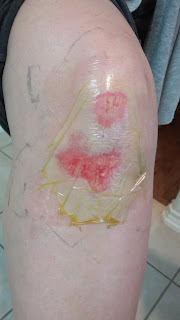 After a really long sleep, a scouring of biker blogs, and a trip to the neighborhood pharmacy, it was time to change the gauze. I had a feeling that process would be unpleasant, and yowee, I was right. But that’s okay, because this gauze-ripping experience would be my last. Next round: Tegaderm dressings. These are officially awesome. They don’t stick, so you don’t screech in pain every time your skin moves. They stay on in the shower. And supposedly the bathtub, though I haven’t tested that myself. 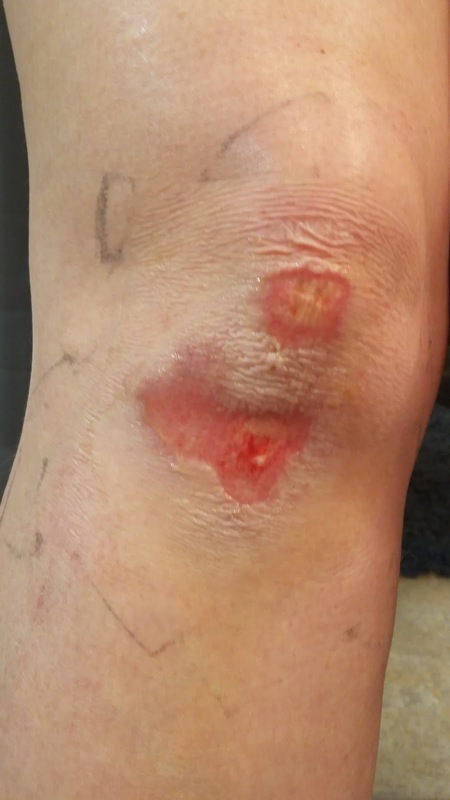 They last for up to 7 days (biker blogs say more like 3-5 days, due to ooze from the road rash causing the adhesive to fail). And, best of all, they’re transparent. If I hadn’t used Tegaderm, I would have had no idea that my right knee was skinned in the shape of Texas. Is that amazing or what? Too bad the Tegaderm prevents scars. It would be pretty cool to have a permanent Texas on my knee! This was after the 2.5 mile walk back to the car. Driving 10 miles home caused it to drip sideways. Gravity! Need a little more land north of Dallas, and a little less north of El Paso. But otherwise a pretty darn good fit! After removing Tegaderm #1 (after 4 days it was no longer stuck at the bottom). Panhandle already healing, still a gouge around San Antonio. Tegaderm #2 is now installed!